I was sitting in a restaurant with my mom and stepdad when the bite from that morning began bleeding again. I had gone to kiss my ringneck good morning when she quite ferociously bit my upper lip. 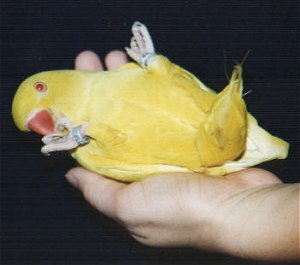 Yellow is my only bird that has a biting problem. Mom handed me a tissue and I started venting about how angry I was at Yellow’s problem. "Why don’t you sell her?" asked my mom. I stared blankly back at her. Was she joking? "Yes. Why don’t you just sell your ringneck?" "So do you just sell your kids when they’ve been naughty?" "I didn’t know if you felt that way." Buying a bird is a huge responsibility. Unfortunately, many people purchase them with unrealistic expectations. Nothing ever works out exactly like you expect. Often the new owner does no research and unknowingly teaches the bird many bad habits. When the bird starts biting or screaming or just doesn’t meet the owner’s expectations it is often sold. These birds get bounced from home to home and are never really worked with to solve the problem. Many end up unhappily confined in a corner somewhere with no interaction at all. With the exception of three quail when I was downsizing, I have never sold or given away I bird I’ve bought, not even inactive pairs or bad breeders. I work around the problem, making adjustments, whatever is needed, but I don’t just throw up my hands and unload my problem on someone else because I made a poor selection. My "children" are not without their problems: Confetti is skittish, Canuk and Toast don’t really like being handled and Yellow bites and screams when I leave the room for two seconds. They are not perfect, nothing is, but they are my babies. The thought of selling me ringneck never even occurred to me. Does this not defeat the purpose of buying a bird? Birds are very different from all other pets. They can match wits with any dog or feline and they are not silent decorations like fish and many herps. And unlike dogs and cats, most of the behavioral problems birds develop are indirectly the fault of the owner. Every little thing you do, every move you make, every tone you use can affect your birds in a positive or negative way. Birds naturally scream at dawn and dusk, habitual screaming is a learned behavior. Plucking can be caused by a number of things as can biting. In my own case, I was sending my ringneck mixed signals. 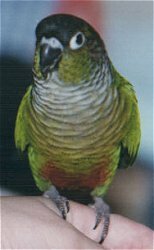 Since I'd become an "aware" owner I hadn't had any major behavioral problems in any of my birds. What frustrated me the most was that my ringneck was misbehaving despite my awareness of bird behavior. Ringnecks live in a matriarchal (females are dominant) society. This may have been part of the problem. She had already been kind of nippy (during handfeeding I had mistakenly let her nibble my fingers...live and learn) and didn’t know the strength of her own beak. Because she is a fairly small bird I’ve always let her on my shoulder. Problems soon began whenever I turned my head- she’d bite the offending object. My automatic reaction was to shoo her away but when she then attacked my fingers I had to smack her off before she attacked my face. This led to her not completely trusting my hands. Half the time when they were presented she tried to "defend" herself by biting. This whole thing became one vicious cycle with her becoming more and more defensive. After she bit my lip a second time (I know, you’d think I’d learned not to give her good morning kisses) I decided something had to be done. My baby was slipping further away from me. I’d tried the usual "No!" and evil eye method, which will snap any of my other birds back in line immediately, to no avail. Her response to this was to puff up and angrily wipe her beak or bite the air. Clearly she didn’t respect my authority. I pulled out my Guide to a Well-Behaved Parrot and re-read on aggression. This was stuff I already knew but maybe needed to be reminded of. Alas, it looked like my only hope was the good old "up" command. Normally I only use it when first taming wild birds so they know what is expected when they are presented with a finger as opposed to a perch. Once the bird realizes that fingers are "friends" I discard using it. Since Yellow was now fearful of my fingers though I decided to try it. I’ve been working with her a few weeks now. She’s nowhere near perfect, sometimes squeezing my fingers a bit too hard or biting them outright, but she has gotten much better. I don’t expect my birds to be perfect angels. Problems can be solved as long as you are willing to work on them. If you aren’t willing to commit, don’t bother buying a bird in the first place, or having kids for that matter.